Content marketing in 2018 is going to hit a new dimension of importance, organization and integration. Smart and savvy marketers know the days of throwing social spaghetti at the wall and hoping it sticks are over and done. It’s not good enough to just create cool visuals, be on Facebook Live video daily and tweet a few links. The social web is getting noisier by the minute. If you are ready to once and for all see a real return on your investment in social media and digital marketing you need to look deeper than the follows, clicks and retweets. It’s time to get 100% proactive to take the time to plan and ensure every piece of content is providing massive value for your audience and aligns clearly to your business goals and objectives. 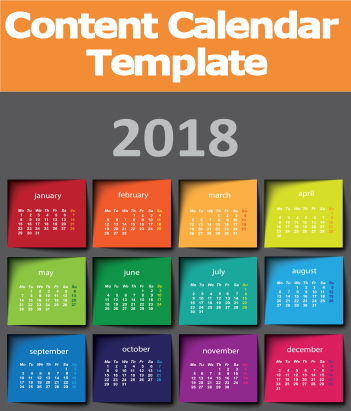 A perfect way to begin adding more organization, prioritization and results for your content marketing is by utilizing a content marketing editorial calendar to plan your content. Showing up on Facebook every morning thinking “hmmm…what should I post today?” is going to get you in nothing better than the “everyone ignores you pile,” guaranteed. This blog post and supporting Social Zoom Factor podcast episode #242 is packed with valuable information to help you get a grip on your content marketing so that you can achieve your business goals and provide your audience with maximum value without having to work 24/7, 365 days of the year. Quality over quantity is where success is going to come from in 2018. Smart marketers and leading brands both big and small know that content is at the core of every social conversation with prospects, current customers, online community members and more. It is content that delivers value, context and inspires the reader, viewer or listener to open, click, read, listen, share and even buy from you. The social networks simply provides a medium for brands and marketers to communicate in unique and personal ways with other human beings. We can’t take the conversations for granted and just assume that because we write the message, the blog post, the status update or even create a stunning Instagram image that our audience will find it useful. We must do our research and not only understand who our our audience is, but also know exactly what their needs are and how we can help them solve their most simple and even biggest life or business problems. Social savvy marketers know how to leverage content marketing to better inspire, connect with and help their audience achieve their goals. They know how to write the blog post headlines that grab attention, the blog post content that gets read, the visuals that gets shared. Smart social content marketing managers know how to whip up 140 character conversations and Facebook posts that keep their audience engaged and continuously activated toward growing closer to their brand. Content marketing is at the foundation of every business of every size. Regardless of your industry, niche, age of company or primary communication medium used, you better have a content marketing strategy to connect you and your brand with your target audience, customers, partners and stakeholders. We are excited to announce the availability of our 2017 content marketing editorial calendar template. The 228th episode of the Social Zoom Factor podcast provides a detailed tutorial to help you create your own content marketing editorial calendar for 2017. 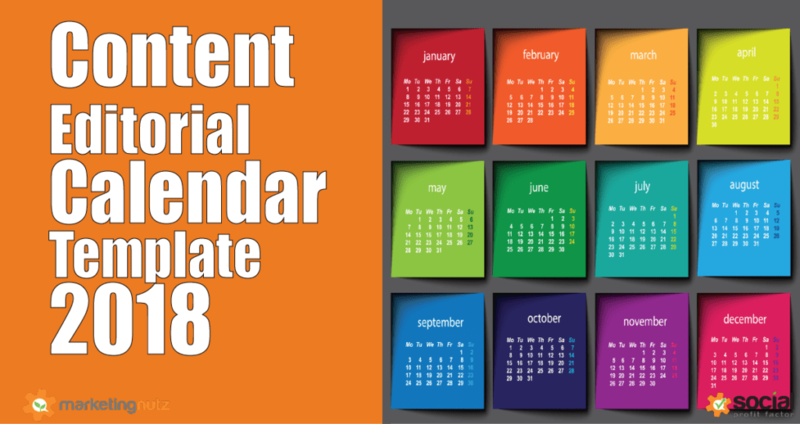 Step 1: Download the 2018 calendar here-> Content Editorial Calendar. Step 2: Listen to the 241st episode of Social Zoom Factor podcast for step by step directions for how to use the 2018 content calendar template. Step 3: Subscribe to the entire series on iTunes, Spotify, Stitcher or SoundCloud! Content marketing is an umbrella term encompassing all marketing formats that involve the creation and sharing of content in order to engage current and potential consumer bases. Content marketing subscribes to the notion that delivering high-quality, relevant and valuable information to prospects and customers drives profitable consumer action. Content marketing has benefits in terms of retaining reader attention and improving brand loyalty. Need more help? Social Profit Factor Training Academy and Marketing Nutz Can Help! Check out our new comprehensive online social media and branding training academy, the Social Profit Factor, that will help create a solid social media and content marketing strategy and plan that will connect you with your ideal customer in a human way! Sign up now to become a founding member and receive some incredible deals plus bonus offers. Need us to help train your team? Give us a shout and let’s get a custom workshop scheduled for your organization. Increase sales by generating more leads using social media and content marketing to nurture relationships. Audience analysis worksheet to help you identify and prioritize your top audiences. Social Communities Seem Negative? Maybe It’s You, Not them. Power of Positivity.